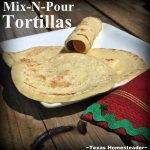 EASY Mix-N-Pour Tortilla Recipe: No Kneading, No Rolling! RancherMan & I eat tortillas. A LOT. But although I finally found a delicious & easy Corn Tortilla Recipe, I’ve never been able to make homemade flour tortillas to my satisfaction. No matter whose ‘Oh So Easy’ recipe I tried, they took lots of time, made a huge mess & turned out substandard. So when we ran out & needed to make a trek to the store to buy more flour tortillas, I decided to give the no-roll tortillas a try. I’m reading that you just mix it up and pour it similar to pancake batter, smoothing them into a thin tortilla with the back of a spoon as they cook. Why not give ‘er a try? If this works we may be able to kiss store-bought tortillas goodbye forever! Stand by, Houston…. There are a couple of things I don’t like about our commercially-purchased tortillas. First it’s the constant addition of plastic brought into the house. Now I’m careful to make sure I reuse those bags before trashing them, but I’m not able to recycle them so eventually into the trash they have to go. I’ve been on a battle to reduce the amount of plastic (or any kind of trash really) that comes into/leaves this house and our frequent tortilla purchases have brought in these little plastic bags time & time again. PLUS, once I looked at the ingredients on the flour tortillas we’re buying… Yowza! I’m not even sure what all of these words even mean! I’d much rather have ingredients I know & recognize instead, how ’bout you?? So I decided to try once again to learn to make our tortillas. I’ve seen no-roll tortillas before but I used Home Joys recipe as a base recipe because they looked super quick & easy. But although I loved the texture of the finished tortillas and RancherMan enjoyed the taste, to me they weren’t quite flavorful enough to fit the bill. But I’ll not be deterred, making tortillas has been something I’ve tried and tried again with determination but have failed each & every time. So I tweaked the recipe to fit our tastes and now we love the result. Since they’re a mixture of flour & cornmeal they’re reminiscent of a street taco tortilla – I like it. Not quite the same texture of a traditional tortilla. Almost like a very thin, flat, tortilla-flavored pancake. And unlike the homemade flour tortillas of my past, these tortillas turned out soft & easy to bend and roll without cracking & tearing. It’s a very important quality since RancherMan likes to roll them up & eat them hot off the griddle. I also like to mash some of our Ranch-Style Beans and slather them on these tortillas, sprinkling with a little cheese & rolling the tortilla to make a bean & cheese burrito for a fast lunch. These tortillas fit the bill quite nicely for both uses and it seems they’re are also much more filling than the commercial counterparts. I made the first batch of tortillas street-taco sized. When spreading the batter I spread it very thinly to about 4″ across to make a smaller & thinner tortilla. My recipe made about 22 thin street-taco sized tortillas. The second batch I made larger and somewhat thicker 5-6″ tortillas to use for homemade enchiladas, fajitas and such and the recipe made 9 or 10 tortillas of that size. They also were very easy to roll without cracking or breaking. I love these! No longer do I mix up a batch of tortillas and knead, let rest attempt (and FAIL) to roll the dough thin enough. And then having them power-shrink the minute they hit the *comal until they’re a thick, dry, bland, sorry excuse for a tortilla. Using this recipe I simply mix the batter, pour them onto a hot comal or griddle, flip to cook the other side and BOOM! Homemade tortillas. Finally I can whip up a batch of tortillas start to finish in about 15 minutes! And I’m also thinking I can season them specially for a dish I’m making – maybe by adding some paprika, or perhaps some ground dried jalapeno to spice things up a bit. There are so many options when you’re making it yourself! But they’re so delicious that RancherMan is tearing through them (and raving about them) so quickly that I hope I can keep up with his now-ravenous tortilla appetite! LOL Next time I may consider a double batch…. Give it a try, y’all! Combine all ingredients & whisk together until batter is smooth. Lightly oil cast-iron pan or griddle (I used bacon grease on a griddle) & heat on medium-high heat for a minute or so to get it hot. Pour 1/4 cup batter onto hot surface. Use the back of measuring cup to spread and thin the batter to about 5"-6" tortillas. After about 2 minutes cooking on the first side, flip and cook the remaining side. When tortilla is fully cooked remove from pan and stack on plate until all tortillas are cooked. 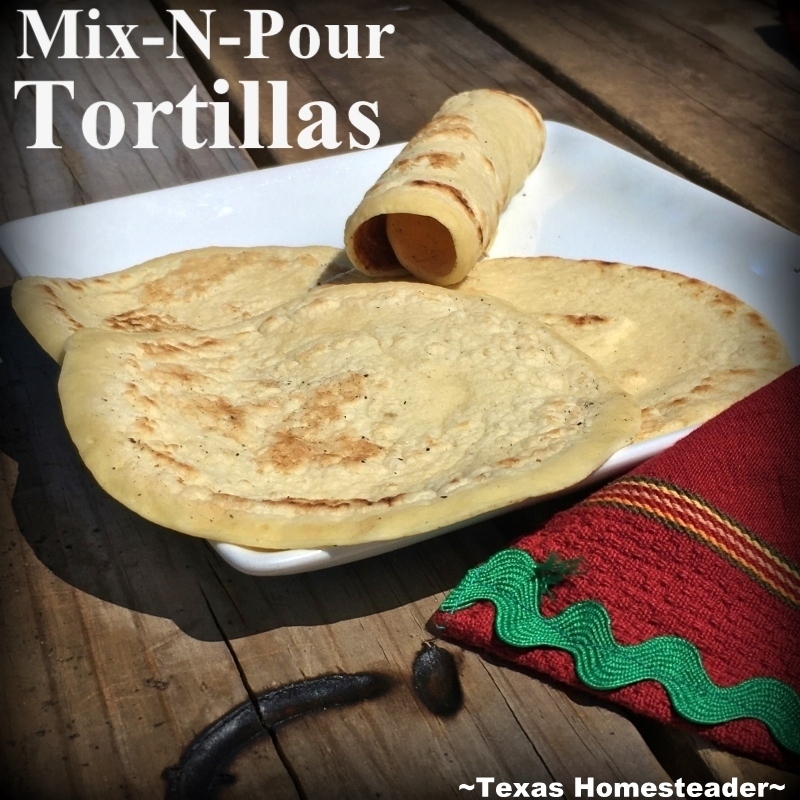 Enjoy tortillas hot or allow to cool & place in airtight bag and store in the refrigerator. Consume within about a week or so. This entry was posted in Blog Posts and tagged Cooking, Frugality, Make-It-Yourself, Recipes on August 31, 2016 by Texas Homesteader. I make these every time my kids say, can we buy flour tortillas and they eat them all! This is the best recipe EVER! Thanks for sharing this it is so much cheaper than buying 12 tortillas for $3! I like it is homemade and saving time and money at same time! Again…THANK YOU! Approximately how many 10 inch burrito size tortillas do you think I could get out of one batch of your recipe? also after the tortillas are cooked is it safe to stack up them up together while thier warm or will they get stuck together like the raw dough type does?, What is the best way to reheat them from a cooked, but frozen state? Thank you for sharing this recipe, it is the answer to my tortilla making prayers! now if i could only find a similar type to make Wonton wrappers. These were a big hit! I will never buy tortillas again! Thank you for sharing TMH!! How long do these last keep? Can they be Frozen? Hummm… Well RancherMan goes through them pretty fast, ours are usually gone in a couple of days. But they have no preservatives so I’d assume 4-5 days or so?? I don’t see why they can’t be frozen. 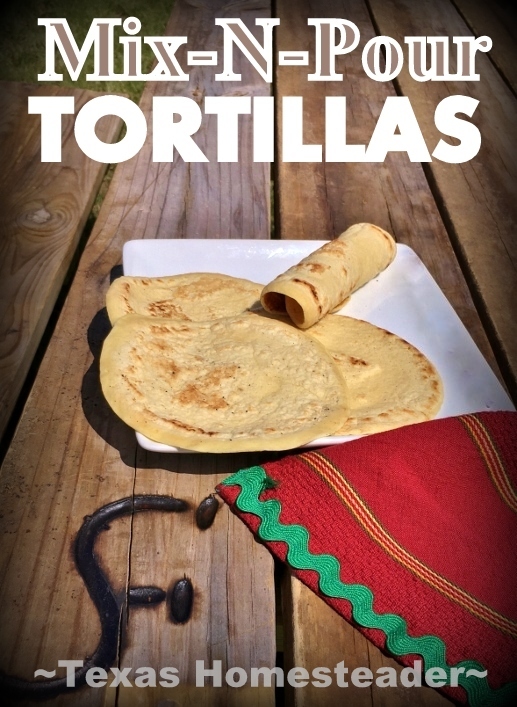 Tortillas aren’t as hard to make as people think – this is a great, easy tutorial! Thanks for sharing on the What’s for Dinner Link up! Wow! This seems way too easy. Why have I not tried this?! Definitely will now. 🙂 Stopping by from the Clever Chicks hop. I have a homemade tortilla recipe that I love, but last weekend I needed to bring an appetizer to a party and needed my tortillas to be easier to roll. I tried these out and they were fantastic, so we’ll now be adding these into our rotation! I have never made tortillas before, but can’t wait to try these. Thank you for sharing on Idea Box Link Party. Have a Happy New Year and I will be thinking about you when I’m eating these tortillas! Thank you THANK YOU thank you for this! I tried it today. Sort of. I didn’t get the corn meal. I substituted for Jiffy cornbread mix that I knew I had at home (not the best substitute probably… but I couldn’t stand the after holidays madness at the stores any longer). I LOVE this idea and despite being out of corn meal … they are tasty. Can’t wait to try them with the corn meal. I’m going to have to give this a try. A friend gave me a cast iron griddle pan that is the perfect size for tortillas. The ones I’ve made are the mix and roll style. I like corn ones and have used the masa flour instead of cornmeal. I like putting pureed tomato and basil in my tortillas. Pairs well with a turkey wrap! Of course, those are flour tortillas and not made with corn. I will have to give these a try! Thanks! Thank you for this recipe! I haven’t been buying tortillas from the store because of those nasty ingredients. I have got to try this soon. There is hope since you make it sound so simple! I typically shy away from complicated recipes that take so much time and make a huge mess. Going to have to try this!! Thank you! tortilla pancake! Looks good! Thanks for sharing on the What’s for Dinner link up and don’t forget to leave a comment at the party – Next week’s features that also leave a comment get pinned and tweeted! Thank you for sharing these! I am definitely going to be making them! Good recipe and thanks for sharing! Please come on over https://www.floydfamilyhomestead.com/ to our blog hop and share this!! I’ve been looking for a recipe for tortillas. Going to try this one for sure. Love to read about your adventures on your Texas ranch. Thanks for sharing your recipe! I have soy and nut allergies and it’s hard to find tortillas w/out soybean oil in them. So far, I have only tried a couple of tortilla recipes, but I haven’t been happy with the results. I am excited to give this recipe a try! One good thing about my allergy is that it has forced me to try making more meals from scratch! I already have a great tortilla recipe, but it does require a little messiness in the kitchen. I’m definitely going to give these a shot. They sound like a great choice for enchiladas or breakfast burritos. We are spoiled for homemade tortillas, and I can’t bring myself to buy the ones from the store any longer. They just don’t taste good to us now. It seems like a crime to grill up delicious fajitas and then put them on subpar tortillas, don’t ya think? It’s funny that you mentioned your ranch bean recipe. I am cooking up a huge batch today! I find that I don’t have to increase the liquid part very much at all in order to really stretch the amount of beans I cook. Plus, none of that good sauciness goes to waste that way since I like the higher bean to sauce ratio. I freeze them in 16 oz freezer jars, but they are always gone in no time. Those are the absolute best ranch beans I’ve ever had. Store-bought can’t even compare. Plus, I get to smell them cooking all morning! Yum! Thanks again for sharing that recipe. Oh, How Wonderful! Boy, will my daughters appreciate this. Thanks for sharing the recipe and for all the hard work into getting to this point. I bet a person could also make green tortilla’s just by adding a little green food coloring to the batter My thanks to you from them.